I don’t think I’ve ever told you guys about my housekeeper! Have I? I’ve told some of my followers about her on social media, so if you follow me there you might have met her already. If not, let me introduce her. My housekeeper’s name is Roomba. She’s a darling round little lady :). I’ve had her for a couple of years and I just love her to pieces. I can’t imagine living without her now! She’s like family. 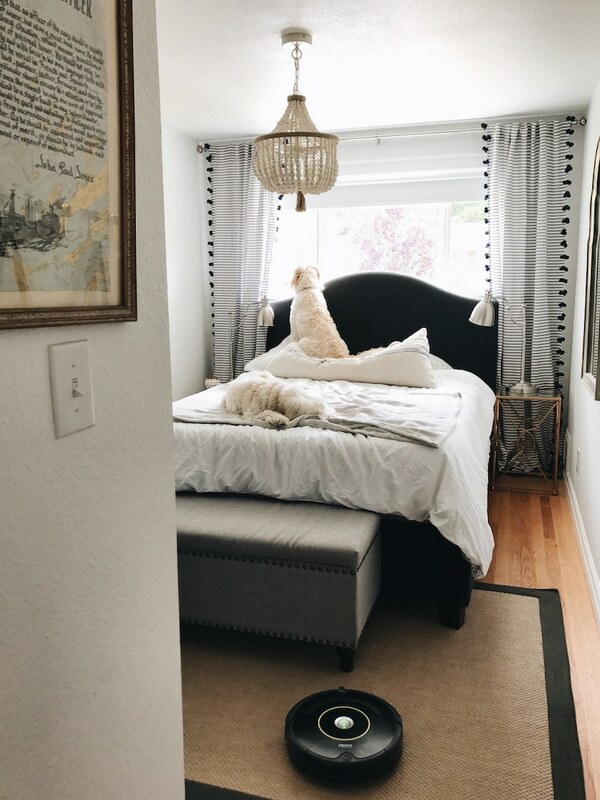 She travels around the house picking up all those pesky dust bunnies, the flyaway dog hair (even though our dogs don’t shed, they still have hair that creates dust bunnies!) and keeps our floors free of any sand or dirt that finds its way inside. 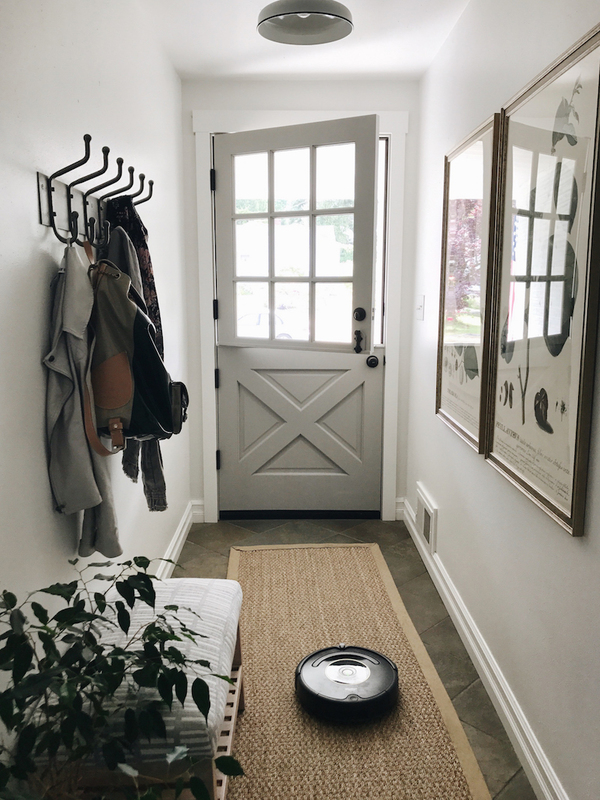 Roomba can travel across our hard floors, rugs (and easily goes up and over the edges of them! ), and under beds and furniture. I used to think a housekeeper like this would be unnecessary, but I was so wrong! It is amazing it is to have a little helper keeping up with my floors every day. .You can see a little video snippet above of how it goes up and over our thick rug! Get your own housekeeper HERE! She’s worth every penny :). I love our Roomba, too! I call mine Roombert, and he’s a workhorse! I love mine as well. Our is called Rosie. Ah, Rosie is the PERFECT name for her. I want one SO bad! However, I think it would be a disaster if my cat yacked up a hairball -which she is known to do fairly frequently. I can just see barf tracked all over my house. Yuck! Oh yeah. Agreed. What I do to avoid any unexpected situations is to do a quick run through and pick up anything that I wouldn’t want to get sucked up or spread around. Then I turn on Roomba and head back to my own tasks. She is very efficient and I can get more done knowing she’s handling the floors! I’m fascinated by the Roomba but haven’t taken the plunge yet. Someday, soon! I can’t wait to get mine that I ordered yesterday! I have two dogs that shed terribly and it’s quite a chore keeping up with the dog hair! Hi Melissa! Excited to meet you at Haven this week! I am obsessed with Dutch doors! If you need any help let me know. I’m traveling with my sister! Hi Melissa, could you tell me where you got those large prints on the wall? I cannot see them very well but they look like botanicals. I am currently looking for something similar. Thanks! Love your blog! They are from Ballard Designs!